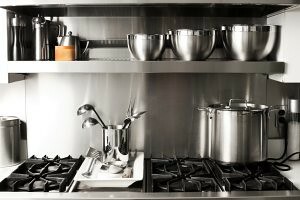 The regulars who read my post would know that there are a few cookbooks that I tend to cook from alot. Bourke Street Bakery is my latest favourite and there is Keiko Ishida's Okashi which has inspired me again and again. For anyone who is interested in baking, Tish Boyle's classic duo, The Cake Book and The Good Cookie would probably be part of their baking bibilical collection. Her books are the type of rare classics which you know, just by reading the recipes, you can trust. The books have a straight forward, down to earth quality which suggests 'tried & tested' - goodness and authenticity guaranteed. Hence, when I decided to bake a simple, authentic pound cake to go with the Kumquat I lugged back from Korea, I knew I had to turn to Tish Boyle for inspiration. 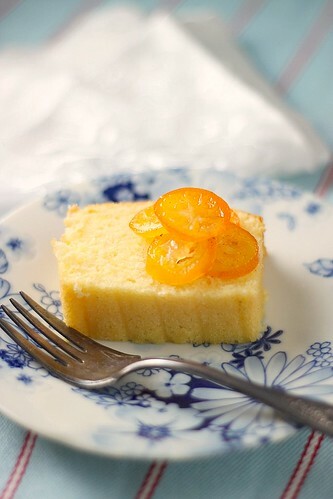 The Kumquat, macerated in a vanilla flavoured syrup has been known to pair well with a simple, buttery pound cake. When one returns to basic simplicity devoid of frou frou and destractions, you know you have nowhere to hide and have to make sure that the recipe delivers 100%. A good example is the sponge cake. As basic as it appears to be, I am still afraid of making the genoise sponge. When technique is not on point, you risk ending up with a coarse, dry cake, but thankfully, most of the time, we dress up the cake with other frills such as frosting,fruits and chocolates, making the less than perfect cake less noticeable. Tish Boyle's Luxe Pound Cake needs none of those frilly 'life-savers' . The combination of vanilla and almond extract gives this dense, moist cake an uncomparable flavour. If you've never tried combining vanilla and almond extract together, I strongly urge you to do so as this is possibly one of the best pairing I have worked with- especially for basic recipes such as butter cake, pound or sponge. The Luxe Pound cake has a fine crumb and it was so delicious that when I tasted my first slice of the freshly baked cake, I actually did a little dance. So, instead of smothering the cake with the Kumquat compote, I decided to just leave it on the side as a garnish and a taste exciter. I imagine the cake would taste equally good with orange flavoured fresh cream. Make yourself a nice cup of Darjeeling or Earl Grey, you would have the created for yourself, the perfect Luxe Afternoon Tea. 1. Preheat oven to 160C. Sift flour, baking powder and salt together. Set aside. 2. Place softened butter in a mixer fitted with a paddle fixture. Cream butter at medium low speed. Add sugar in 3 separate additions, allowing sugar to be incorporated with butter after each addition. The butter should be creamy and pale after all sugar has been well mixed. 3. Add eggs one at a time, allowing the egg to be mixed well with the butter after each addition. 4. Add vanilla and almond extract. 5. Reduce mixer speed to low and add flour mixture in 3 portions, alternating each addition with a portion of the heavy cream until all flour is added. 6. Pour batter into a lined/ buttered pound cake pan. 7. Bake at 160C for 50mins or until a skewer inserted into the cake comes out clean. 8. Cool down cake to room temperature before turning out the cake carefully from the baking pan. 9. Serve with Kumquat Compote. 1. Clean Kumquat and slice each kumquat horizontally in half. Remove pits. 2.. Place sugar and water in a heavy saucepan. Heat up the saucepan until sugar dissolves and just begin to simmer. Add Kumquats and simmer for about 5 mins. 3. Cool down to room temperature. Place a round piece of baking paper over the kumquat to keep it submerged in the syrup. Leave this in the fridge overnight. 4. Strain kumquat from Syrup. Return syrup into saucepan. Heat up syrup to a low simmer. Add vanilla paste and let simmer for 3 minutes. 5. Remove from heat. 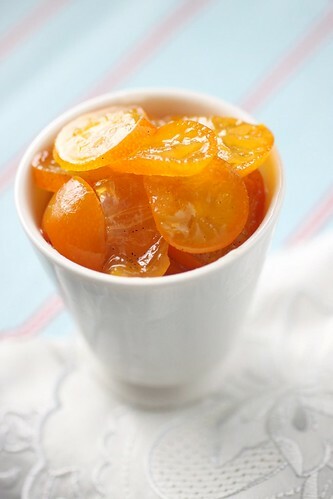 Pour syrup over kumquats in a storage container. Cover and refrigerate overnight. And the recipe looks very similiar to the Elvis cake I did recently, except for the extracts used as well. There are no more kumquats over here, and I guess you must have gotten yours in Korea. the cake look so soft and fluffy! i can imagine myself enjoying this yummy treat! (: delicious! The cake looks so confident of it's self....if you know what I mean. It looks very moist and buttery just as a pound cake should be. I bet it tastes fantastic with the kumquats added and the flavour pairings. Must try! The cake looks beautiful! I can see why you did a little dance :) The kumquat compote makes the kumquat look like mini yellow tomatoes..haha! I've never tried vanilla and almond extract together :O It sounds delicious though! I completely hear you about Tish Boyle. I have her Cake book and absolutely love how I know her recipes will never let me down. This cake looks like an absolute winner with a tight and fine crumb! Zurin- you are spot on! Confident is exactly how I would describe this cake! The Cake Book by Tish Boyle was one of the first few books I read every night as though it was a bible. I have tried a couple of her chocolate cake recipes, and like you say her recipes have not failed me. Even with just a few illustrations, her book is still able to draw my full attention. Your excellent baking skill has made this pound cake lives up to its name, great job! Looks like I'm not satisfied with the other pound cakes I've baked before. I got to try this recipe! Again..such eye candy:) Very very pretty..
Shirley, this cake looks compact yet moist. I bet is yummy. Nearly lugged home this book but was deciding Dorie or Tish and in the end I chose the latter. Between the poundcake and the candied kumquats, I don't know which I'm more enamored with. both are equally beautiful. beautiful pound cake, the texture is simply divine! I love the texture! Looks super soft and moist. Your dessert always looks so exquisite and gorgeous! Well done (again) :D)! 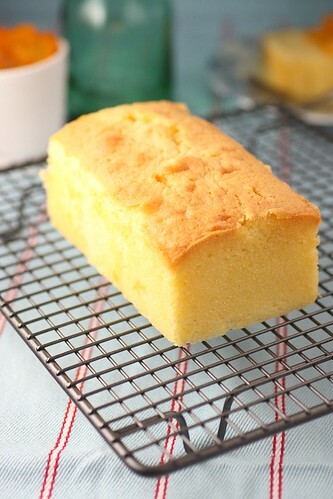 I love the soft crumb and delicate texture of Asian-style pound cake. It's something i haven't mastered yet and from looking at the pictures that's a recipe i should be trying very soon. The Luxe Pound Cake was the first recipe I tried out of Boyle's book, and it's the first one I turn to now whenever I'm in the mood for pound cake! It amused me to see you use only about half the sugar. Now I'm not sure if I should follow the original recipe or reduce it as well. Where do you get your kumquats? I can't wait to get kumquats again, they are surprisingly versatile! This sounds delicious Shirley! @Pickyin- I took my chance to reduce the sugar and it worked out really well. I am very pleased with the level of sweetness. Kumquats? I lugged back from Korea but I did see them at CS Takashimaya and Isetan supermarket. 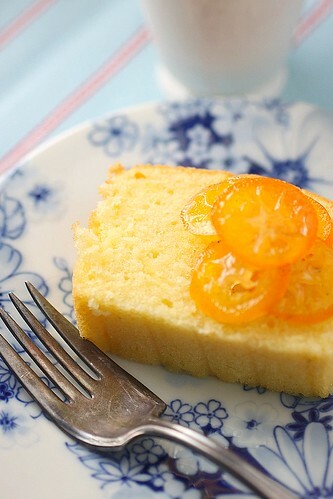 Your pound cake is perfectly baked then your kumquat make me drooling over it. @Jane- what pro? I struggle all the time with my photos! Whoa the cake looks really soft and moist, must be heavenly! This cake looks light and beautiful. I love bourke street bakery as well. very reliable recipes. Have to check out the other 2 that you mention. your pound cake is nicely done and look so good. Shirley, what a unique combination with kumquat compote! The cake looks perfect and your photos looks great. Nice composition! I missed you that last bloggers meet and hope to meet you someday. Have a wonderful week. How how pretty! I love how fluffy the cake looks and I am sure it tastes just like that. I would love to have a slice with tea! A really simple but gorgeous cake. 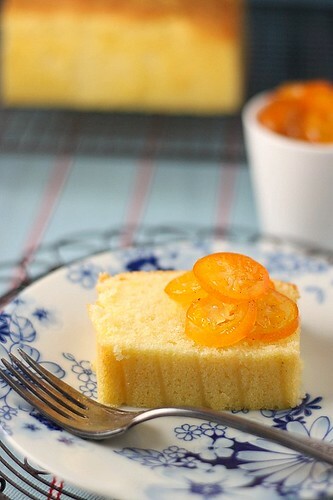 I like the use of the kumquats as well though personally have not tried it in baking. I've tried a couple of Trish Boyle's cake recipes and both were a success. thats a delicious looking cake with the kamquat compote. Have yet to use cream to make any cakes yet. Bet it works well as a tenderiser. From my experience, genoise cakes tend to be dry and needs to be brushed with syrups if they are baked in round pans (lower baking temp of about 180 degrees C, higher baking times = more loss of moisture)for use in layer cakes. they are much more moist when baked in sheet pans when the baking temperature is higher (200 degrees C) and the baking time is shorter, hence less moisture is lost. the amount of moisture in the genoise recipe do play a part too. Beautiful cake, specially with the kunquat compote, looks delicious :-) Have a great week ahead! @baKertan-ZY, thanks for sharing your insight. You are right that genoise sponge needs to be brushed with syrup but still It is rare that I come across a well made one. I prefer to work with a soufflé sponge most of the time. I like the golden color of the cake, looks so nice and delicious. A rich pound cake with perfect texture. And the kumquat compote is like icing on the cake! a tight crumbed cake good enough to eat on its own! I can so totally relate to your little dance. This would go nicely with a pot of tea. Your cake looks delicious! Does the recipe only make one loaf? I wasn't sure when reading the recipe. It uses so many eggs, I was hoping (health-wise) that it might make more than one loaf. @kirbie, I actually halved the recipe and still get about 2 small loaves. For 2 or 3 people, I suggest you start with half the recipe first. Which particular brand of heavy creaM you use? Your pound cake looks fine and nice. @Anonymous: sorry I missed your question. Am still on business trip. You can use any packet fresh cream you find in the supermarket. I use Emborg in this case because it is the cheapest one I could find. Hi Shirley! Sorry I've been busy with midterms and fallen behind on commenting. I mean I loved your blog before, but your photos are getting even more amazing lately! This looks so so good. @xiaolu, don't worry about it. I myself, have been traveling and am finding it a challenge to catch up everyone. >shirley The pound cake looks yummy. I wish I had a slice of it on this rainy day. Ooo it actually makes 2 loaves. Am thinking of serving it with homemade vanilla ice cream tm. Haha.. Thanks for the lovely recipe. I made 3 mini loaves. The aroma of the vanilla and almond extracts are making it hard for me to resist eating it! @Christine- I am so glad you got to try this! I know exactly what you mean about the aroma!